When it comes to advertising and marketing, there’s nothing quite as good as a lively brand war, and one has been brewing lately between Lyft and Uber. Their weapon of choice? Visual content. The two companies vying for the top spot in the instant ride business have been battling back and forth, trying to recruit troops for their growing armies of drivers who will pick you up at a given location just with the tap of an app button on your smartphone. 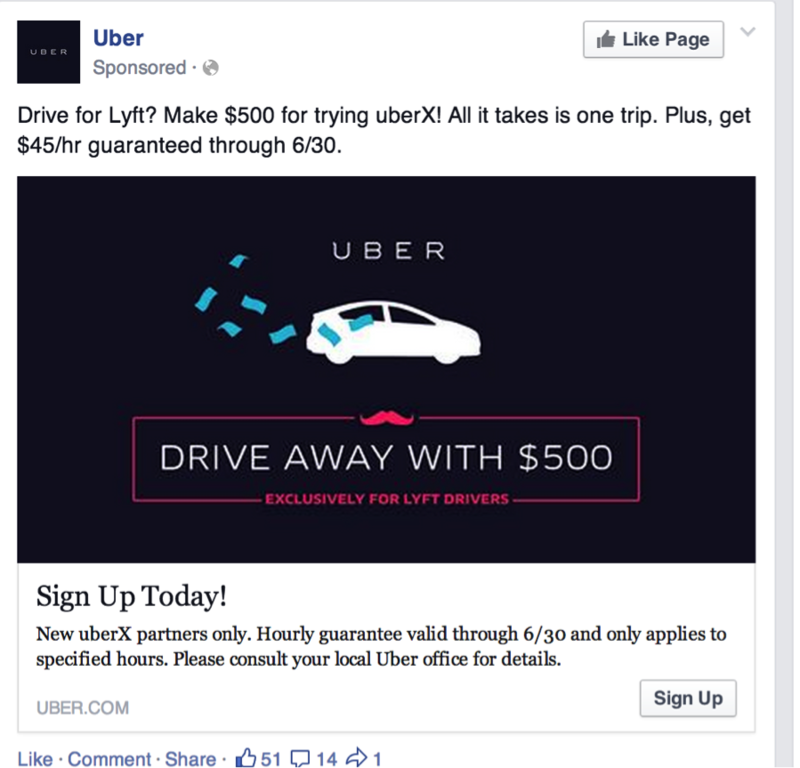 Uber launched the first salvo in the battle with a promoted Facebook post aimed at recruiting Lyft’s drivers, offering $500 up front and $45/hour to drivers currently working for Lyft who switch sides. 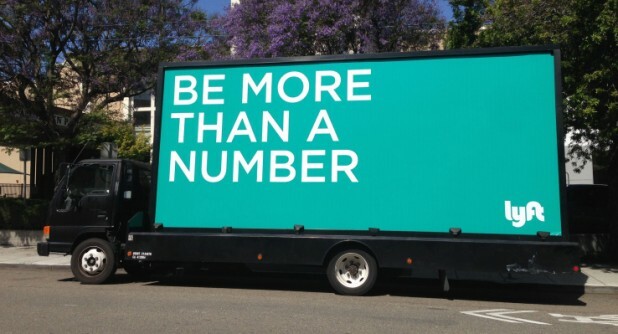 This prompted an intense counter-offensive from Lyft that saw the company park a huge billboard truck right in front of Uber’s San Francisco office, inviting their drivers to “be more than a number” with Lyft. Aggressive tactics by like this are not new for Uber, as the company launched another visual campaign against Lyft around this time last year by driving a giant billboard around San Francisco telling drivers to “Shave the Stache,” and leave Lyft, which is widely recognized by its iconic pink moustache logo. According to TechCrunch, Uber has even admitted that its tactics can be “too aggressive” after it launched a DDoS-style campaign January against its New York competitor, Gett. While the methods of delivery and technology may have changed over the years, brand wars like this have been waged since the beginning of the 20th Century, and there have been some lively ones over the years. 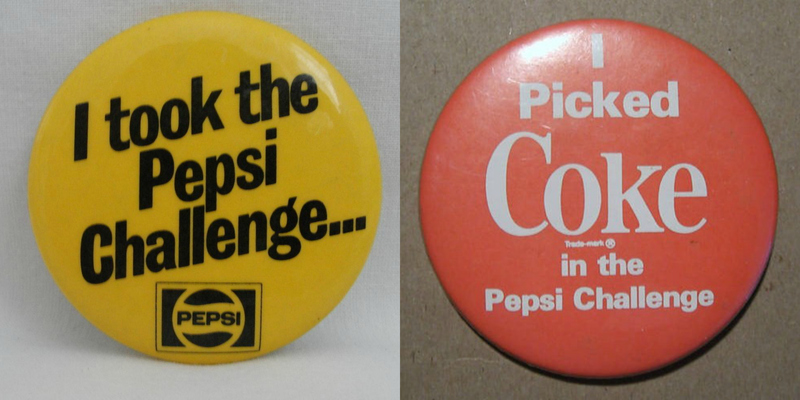 The world’s two largest soft drink brands have been battling it out against each other since the mid-20th Century, with the conflict largely coming to a head in 1975 when Pepsi was victorious over Coca-Cola in the Pepsi Challenge, something Pepsi used as ammo against Coke throughout the Cola Wars of the ‘80s and ‘90s and continues to hold over their head to this day. In an era that predated social media and the internet, the companies used “real-life” visuals – T-shirts, buttons and posters – to spread the word. You’re either a Mac person or a PC person; never the twain shall meet. And that’s exactly the way these two foes would have it, based on the intense rivalry the two have maintained since Apple first poked its head onto the tech scene in 1984 with a jab in the ribs to Microsoft via its innovative and now infamous 1984-themed commercial. Since its initial attack, Apple has continued to fire on Microsoft for decades – perhaps most famously with its “I’m a Mac; I’m a PC” video ad campaign. 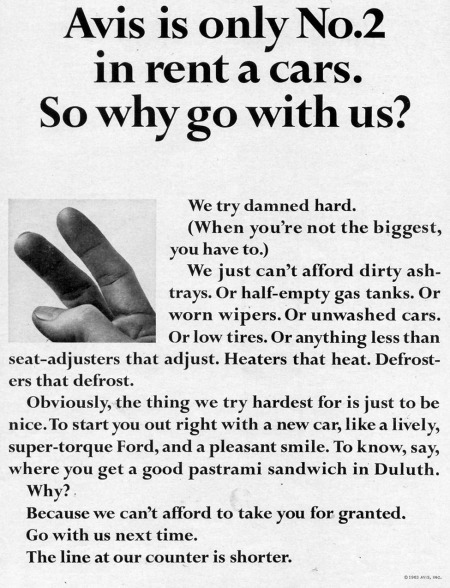 In the early 1960s, Hertz was the top car rental agency in the U.S., while Avis was in decline. The only way to for Avis to save the company was to launch an all-out war on Hertz and they did so in an innovative way – by embracing their second-place position and turning disadvantage into advantage through a series of ads featuring little more than a simple image and a classic serif font text. Avis painted itself as a company that tried harder to please its customers, while Hertz was so big it didn’t have time for customer care anymore. These days, brand wars are more likely to be carried out on in visual format on Facebook or Twitter, but the concept is the same and just as bold: tell the public directly why they should choose you over your competitor. And the end result is the same: each drives the other to improve their products or services in the constant struggle for market supremacy. Colin Payne is a professional writer, photographer and visual journalist.